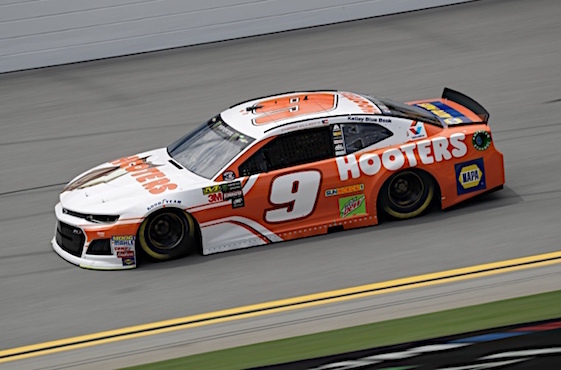 Chase Elliott, hobbled by a sprained ankle that he sustain during “horse play” around his swimming pool on the Fourth of July, claimed the pole for Saturday night’s Monster Energy NASCAR Cup Series during Friday’s qualifying session at Daytona International Speedway. Elliott’s pole-winning lap came at 194.045 mph at the 2.5-mile Daytona oval. “I didn’t know it was that fast,” Elliott, still looking for his first Cup victory, said. “We made a couple of changes actually at the end of that last practice before the rain and made it go a little faster. I hope that translates to a good driving car tomorrow night. The pole was Elliott’s third at DIS. Second fastest in qualifying was Elliott’s Hendrick Motorsports teammate, Alex Bowman. Owning the front row on Friday has to feel good for Chevrolet, whose cars have been slow all year long. Bowman’s fast lap was at 193.046 mph. Brad Keselowski was the fastest Ford, his No. 2 Team Penske Ford qualifying third (192.802 mph). Hendrick driver Jimmie Johnson was fourth in his No. 48 Chevrolet (192.361 mph), while Kevin Harvick’s No. 4 Stewart-Haas Racing Ford rounded out the top five with a fast lap of 192.345 mph. The qualifying session was pushed back by rain. (9) Chase Elliott, Chevrolet, 194.045 mph. (88) Alex Bowman, Chevrolet, 193.046 mph. (2) Brad Keselowski, Ford, 192.802 mph. (48) Jimmie Johnson, Chevrolet, 192.361 mph. (4) Kevin Harvick, Ford, 192.345 mph. (17) Ricky Stenhouse Jr., Ford, 192.164 mph. (31) Ryan Newman, Chevrolet, 191.812 mph. (34) Michael McDowell, Ford, 191.669 mph. (14) Clint Bowyer, Ford, 191.445 mph. (3) Austin Dillon, Chevrolet, 191.298 mph. (22) Joey Logano, Ford, 191.152 mph. (12) Ryan Blaney, Ford, 190.981 mph. (78) Martin Truex Jr., Toyota, 191.209 mph. (42) Kyle Larson, Chevrolet, 191.140 mph. (18) Kyle Busch, Toyota, 190.913 mph. (62) Brendan Gaughan, Chevrolet, 190.900 mph. (11) Denny Hamlin, Toyota, 190.876 mph. (24) William Byron #, Chevrolet, 190.868 mph. (13) Ty Dillon, Chevrolet, 190.832 mph. (6) Trevor Bayne, Ford, 190.819 mph. (38) David Ragan, Ford, 190.634 mph. (43) Bubba Wallace #, Chevrolet, 190.565 mph. (41) Kurt Busch, Ford, 190.396 mph. (47) AJ Allmendinger, Chevrolet, 190.339 mph. (37) Chris Buescher, Chevrolet, 190.042 mph. (10) Aric Almirola, Ford, 190.034 mph. (1) Jamie McMurray, Chevrolet, 189.777 mph. (95) Kasey Kahne, Chevrolet, 189.649 mph. (20) Erik Jones, Toyota, 189.434 mph. (21) Paul Menard, Ford, 189.203 mph. (32) Matt DiBenedetto, Ford, 188.336 mph. (19) Daniel Suarez, Toyota, 188.001 mph. (15) Ross Chastain(i), Chevrolet, 187.371 mph. (7) Jeffrey Earnhardt, Chevrolet, 187.324 mph. (96) DJ Kennington, Toyota, 186.312 mph. (00) Joey Gase(i), Chevrolet, 185.361 mph. (99) Landon Cassill, Chevrolet, 185.033 mph. (72) Corey LaJoie, Chevrolet, 184.976 mph. (51) Ray Black II(i), Chevrolet, 183.146 mph. (23) JJ Yeley(i), Toyota, 182.730 mph. (92) Timothy Peters(i), Ford, 181.068 mph.